The NEW Daily Decision for 9.4.18 - The Pause That Refreshes? | Marketfy or install Google Chrome Frame to experience this site. The NEW Daily Decision for 9.4.18 - The Pause That Refreshes? Now that the S&P 500 has managed to move to new all-time highs, the obvious question becomes, where do we go from here? Our furry friends in the bear camp contend that the prolonged period of consolidation that occurred between January 26 and August 24 means the current run for the roses is likely doomed to fail. The bear thinking is the January peak had been overdone and the bulls simply don't have the macro firepower to keep things going. And the fact that it took the bulls nearly 7 months to make a fresh new high is Exhibit A in the latter argument. There seems to be a general consensus that long pauses in between new highs aren't a good thing. Those seeing the market's glass as at least half empty also suggest that seasonality, the possibility that earnings have peaked, the Fed's plans to keep raising rates, the mid-term election uncertainty, the trade war, and the President's legal issues will combine to keep stock prices from getting overly enthusiastic in the near-term. However, if one removes the talking head chatter and the daily news flow, the actual history of long pauses between new highs in the stock market appears to be encouraging. According to Ned Davis Research Group, there have been seven prior instances where the S&P 500 experienced a long pause between new all-time highs (defined as a period of at least 6 months). So, the first point is that while long pauses between new highs aren't the norm, they are not all that unusual either. Digging into the data, we find that once the long pause ended and the S&P 500 made a new high, the bulls tended to remain in control of the game for some time. An average of 355 trading days to be exact. And during that time, the bulls managed to distance themselves from the old highs and keep movin' on up - by an average of 38.7%. Thus, one could argue that strength tends to beget strength in these types of markets. Yes, there were a couple instances where the bulls quickly surrendered - 1948 and 1990. The 1990 case can be blamed on the start of the first Gulf War. If you will recall, there was a great deal of angst about what would happen to the economies of the world when Iraq decided to try and expand its beach front holdings. I don't have much info on the 1948 event. So, I'll go ahead and say that with these two exceptions (where the S&P 500 gained 6.6% and 4.1% respectively before the bears took charge), history shows that most of these long pauses in between new highs appeared to reinvigorate the bulls. The bears are also quick to point out that the U.S. stock market appears to be the only game in town these days as a great many foreign developed and emerging markets are struggling mightily. The thinking here seems to be that the U.S. simply can't go it alone. Again, turning to the historical data (and the computers at NDR), it appears that since MSCI started keeping the ACWI ex-US index in 1987, there have been 10 prior cases where the S&P 500 has outperformed the ACWI ex-US Index by a significant margin (defined here as at least 10%) over a 12-month period. Cutting to the chase... In all 10 cases, the S&P 500 was higher one year later - by an average of 16.8%. Yes, there were drawdowns along the way - there usually are over a twelve-month period. However, when the S&P 500 was not in the midst of a bear market during the time of the drawdown, the pullbacks were much shorter and much shallower than average. So, the takeaways from this morning's brief history lesson are (1) long pauses between new highs in the stock market are not bearish omens. In fact, the bulls tend to romp higher once the pause ends. (2) The U.S. can "go it alone" with regard to the global markets. One can even argue that the U.S. leadership keeps the bulls engaged. And finally, if the bears do come to call after a long pause where the U.S. is leading the charge, the damage tends to be less severe than average. So, from my seat, these are a couple more reasons why it is probably a good idea to continue to stay seated on the bull train. Sure, the ride may be bumpy at times - it usually is. But, this is simply how the game is played and it is important to remember that some of the bear arguments these days aren't rooted in fact. 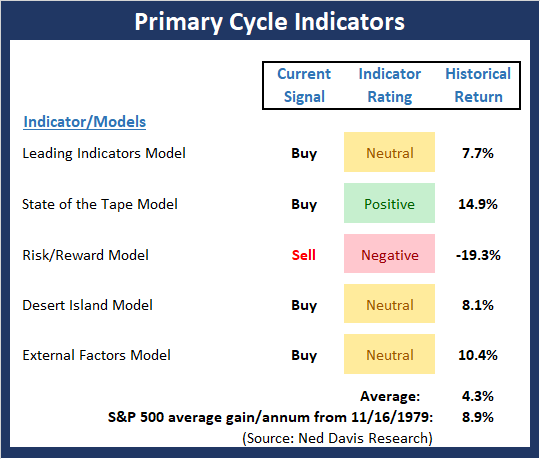 Despite the market moving to a fresh all-time high last week, some of the readings from our Primary Cycle board went the other way. For example, the Desert Island slipped back into the neutral zone while the Risk Reward models fell into the red. The good news is that none of the recent buy signals have been reversed and the moves were very small in absolute terms. Such is the case when indicators wind up flirting with important lines in the sand. The bottom line is it the board now has a more neutral look than it did to start last week. It is said that the most bullish thing a market can do is make new highs. Not surprisingly then, the Trend Board is in good shape to start the week. There is good news and bad news to be found on the Momentum board this week. 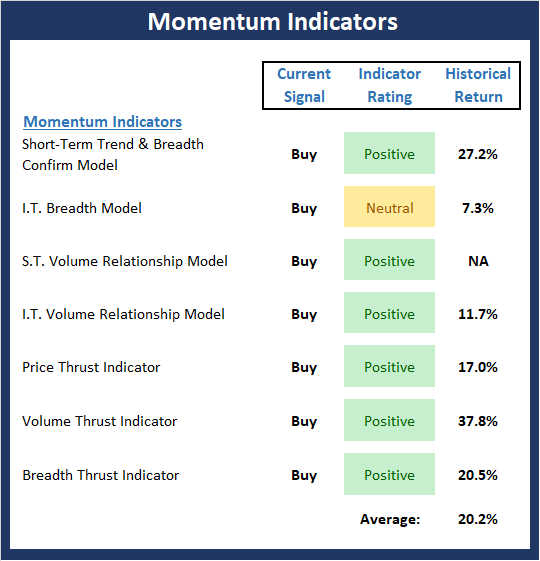 The good news is the "thrust" indicators are now all green and the historical return of the market given the current state of the momentum indicator readings is strong. 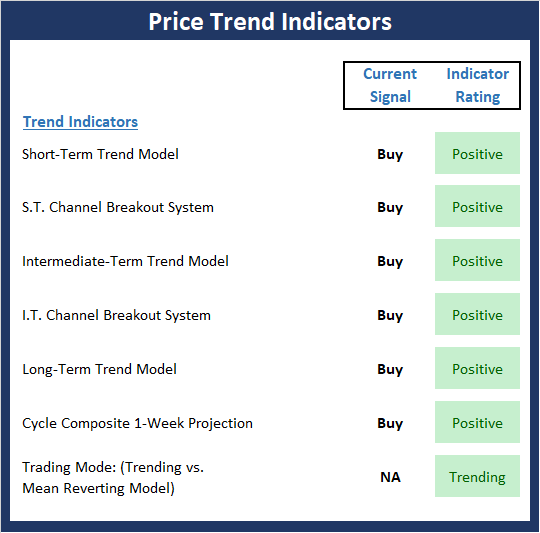 However, the intermediate-term breadth model slipped a bit as the momentum the broad market has failed to impress. But given the abundance of green on this screen, the bulls should be given the benefit of any doubt. The "Early Warning" board appears to be suggesting that the bears may have an opening in the near-term. 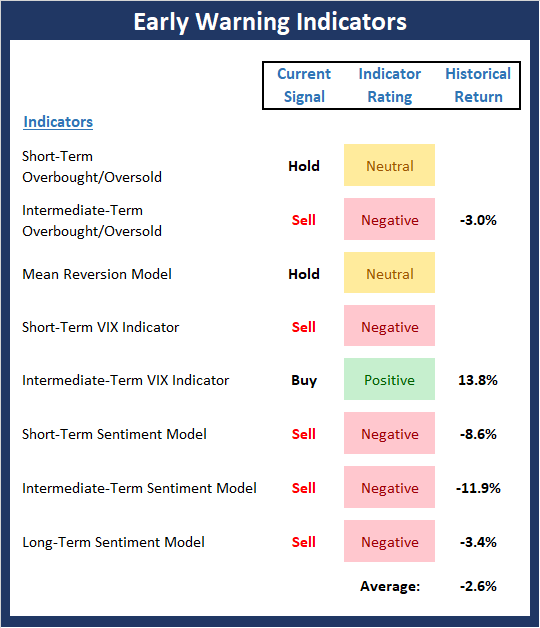 Stocks are once again overbought and sentiment has become overly optimistic. As such, we should be on the lookout for a reversal "trigger" and then be ready to observe if the bears can generate any momentum when their turn comes. 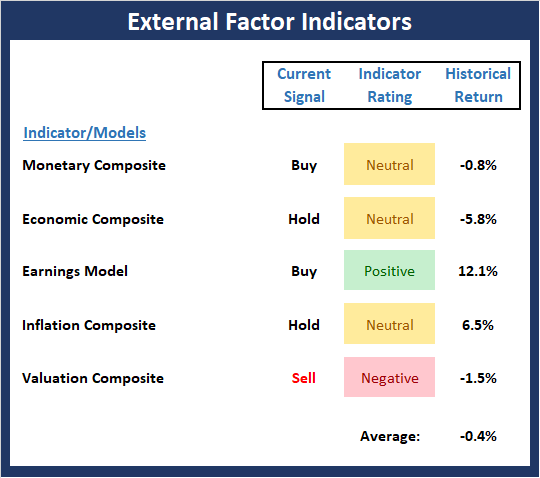 The External Factors board continues to be unimpressed by the recent price action. This tells me that we are not in the early innings of the game and to remain alert for any changes to the macro picture. We are pleased to announce that the latest upgrade to the Daily Decision service went live on Monday, July 9. The new, state-of-the-art portfolio is a multi-methodology, multi-strategy, and multi-time-frame approach that is comprised of three parts. The Risk-Managed Growth portion is made up of three trading strategies and accounts for 50% of the portfolio. The Market Leadership portion makes up 20% of the portfolio. And the Top Guns Stocks portion (10 of our favorite stocks) will make up the final 30% of the portfolio. At the time of publication, the editors hold long positions in the following securities mentioned: SPY, IJR, QQQ, XLK, XLY, XLV, AAPL, MSFT, GOOGL, FB, AMZN, CNC, ICUI, TRU, VFC - Note that positions may change at any time.